We are experts in Thermal Management, Thermal Analysis, and Thermal Design, ensuring reliable electronics. Experienced in Heat Transfer for Sealed Electronics. For many electronic products, thermal considerations are the primary obstacle to achieving highly reliable operation. Electronic failure rates typically double for every 10°C rise in operating temperature. Fans can help lower component temperatures, but many products avoid fans because of problems with noise, filter maintenance and fan failure. It can be very challenging to design an electronic subsystem that is cooled only by convection, especially in the military environment where high ambient temperatures are common. Achieving this goal requires innovation in electronic design to reduce power dissipation and careful attention to mechanical/thermal details to achieve efficient heat transfer. An example project is an environmentally sealed military power distribution and switching unit with an ambient temperature spec of 60°C. The first step in our design process was an innovative power switch that reduced power dissipation from nearly 300 watts to just 150 watts. Presco then developed a chassis that utilized metal backed circuit cards and wedge locks to transfer heat from the power components to the side plates. From there, heat pipes provided a very efficient path to thermal convection chimneys, which supplied adequate cooling without violating the environmental seals of the chassis. A further design innovation was to split the metal backing-plate on each circuit card. The “hot” wedge lock and half backing-plate services hardy high dissipation components such as SCRs, which can operate at very high junction temperatures. The “cool” wedge lock and half backing-plate services sensitive low dissipation control components. The two wedge locks have identical thermal conduction, so the control side of the circuit card operates at a much lower temperature than the power side. This allows a much wider choice of control components to achieve lower cost and multiple sources of supply. Another client tasked us with designing a power conversion circuit for a 1KW man-portable power generator. Each stage of power conversion was highly efficient, averaging 96%. 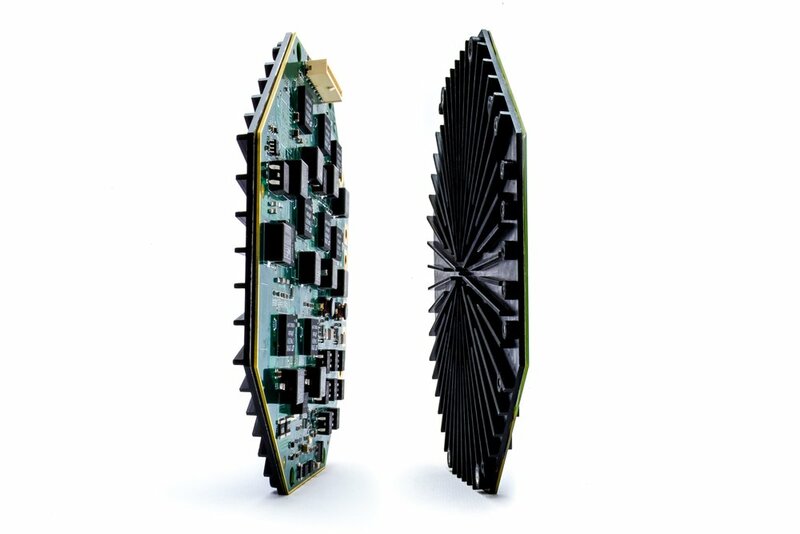 For this product, there was ample airflow from the engine fan, so Presco designed an impingement air flow heat sink that was laminated directly to the power conversion circuit card. This produced a very compact circuit card with low cost and exceptional thermal performance. In the industrial arena, Presco developed the electronics for an infrared spectrometer with a hermetically sealed enclosure. The CPU and power supply cards were designed for pure conduction cooling in order to avoid using a fan. Highly efficient electronic design reduced power consumption to the point where buried foils in the circuit cards were sufficient to conduct heat to fixed mounting rails and hence to the enclosure wall. This resulted in an inexpensive, yet highly reliable instrument with no troublesome fan or air filter.